You’d never guess how many healthy meals can be made with one simple, star vegetable! Move over cats, the internet has a new darling—and it’s cauliflower. This savory staple has starred in aloo gobi for years, but a recent tide of chefs and bloggers are exploring its multipurpose prowess. Sneaking into dishes from appetizers to desserts, you’ll never look at a head of cauliflower the same way again. Oh sure, any amateur can slap buffalo sauce on cauliflower and call it a wing. It takes a real pro, (in this case Keepin’ It Kind stepped up to bat) to create a buffalo wing pizza with a bleu cheese spread. Pasta might be our first love, but there’s room enough in our hearts for more than one definition of mac and cheese. The Healthy Voyager loads florets with two kinds of vegan cheese (plus heavy cream!) for an extra decadent spin on the comfort-food classic. Do try this with Cheddar cauliflower, so named for its cheesy hue! Need a dip that doesn’t quit? Want a chicken stand-in for your next sandwich? Look no further than this delectable, pickle-speckled salad from Gourmandelle. Slather this on your next baguette, or get a little bit meta and dip in cauliflower florets. Want even more cauli-pizza fun? We adore this cruciferous crust from Positively Vegan, made with grated cauliflower and gluten-free flour to make a pizza that’s fit for eaters of every persuasion. 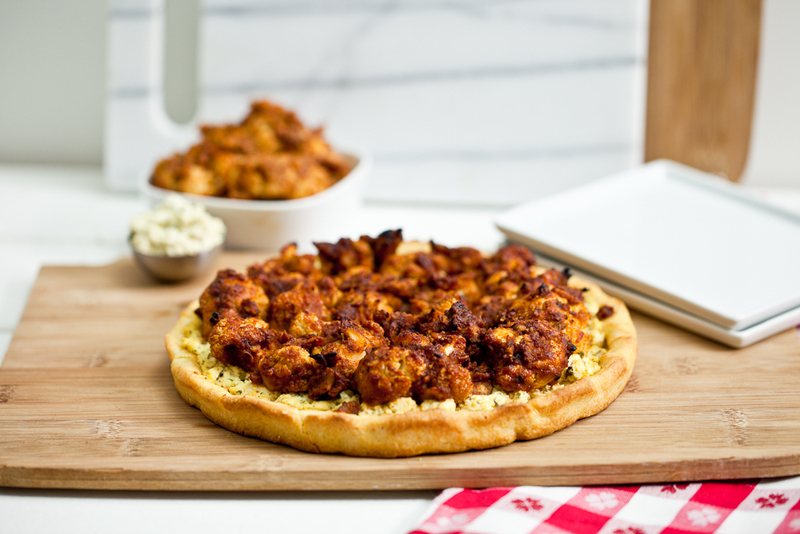 Dare you create a cauliflower crust and top it with buffalo cauliflower? Only time will tell! Boom! Surprise, you’d never have thought to look for cauliflower in cake, right? Thankfully, Chocolate-Covered Katie did, and created an enticing recipe that boasts three of our favorite c-words: cake, chocolate, and cauliflower. That’s right, you can make steak with cauliflower. One of our all-time favorite blogs, Fat Free Vegan Kitchen, offers this sumptuous spin on steak, capitalizing on the culinary trend of replacing white meat with cauliflower. Cauliflower’s creaminess knows no bounds. We love this recipe from Healthy. Happy. Life. not only because it contains our secret ingredient, but also because we couldn’t agree more with the suggestion of serving this savory gem in a bread bowl. These toothsome treats from epic blogger Vegan Richa rely on grated cauliflower and lentils to pack a savory whollop. Stacked with onion rings, spicy mayo, roasted peppers, and avocado, these burgers are sure to satisfy. This easy, delightful dinner works any night of the week. This dish from Oh She Glows pairs cauliflower with its longtime cohort, broccoli, plus a few chickpeas. Roasting the veggies brings out their richness, and a dollop of tahini dressing finishes off the meal. For another variation on the same theme, don’t miss Isa Chandra Moskowtiz’s Roasty Soba Bowl. “Well, what’s so great about potato soup?” you might ask. Firstly, this particular recipe comes from The (ever-wonderful) Vegan Stoner, which means that not only is the recipe top-notch, but it has an adorable accompanying illustration. Second, surprise! Right in the soup, there’s cauliflower, adding a richness to the soup’s base. Basically, if you crossed a tater tot with pizza, these tasty bites would be the result. (OK, full disclosure, these bites and a ton of happiness.) This recipe from Damy Health spills the beans early on that these savory snacks are filled with ‘flower, but we love it despite the lack of deception.